www.drpeppertuition.com – 2015 Dr Pepper Tuition Giveaway Promotion & Contest. Scholarships Contest! Free Money for College! drpeppertuition – Dr Pepper wants to pay your tuition with Dr Pepper Tuition Giveaway. Indeed, Dr Pepper Tuition Giveaway offers you a chance to pay for college and school expenses. This contest has ended. Since 2008, the Dr Pepper Tuition Giveaway has changed lives by giving away millions of dollars in tuition – drpeppertuition.com. With the rising tuition costs, paying for college or university could become a huge indebtedness and it’s not accessible for everyone. Dr. Pepper believe that every student deserves a chance to realize their dream of career. Sponsored by Dr Pepper/SevenUp,Inc. 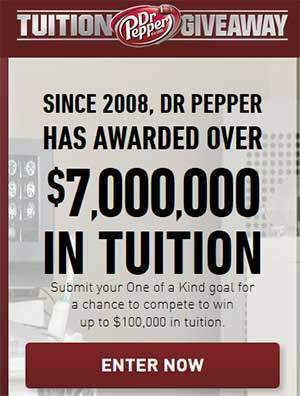 Since 2008, Dr Pepper has awarded over $7,000,000 in tuition with scholarship contests by giving money for education, money for College or University. Visit today http://www.drpeppertuition.com/ and follow the onscreen instructions. 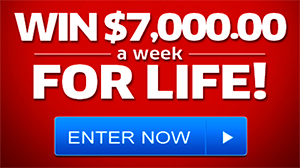 Submit your One of a Kind goal for a chance to compete to win up to $100,000 in tuition. Enter Now or Nominate a Friend. Either if you want to become a Doctor, an Architect or any other profession. This is your chance! They’re awarding over $1,000,000 in tuition to one of a kind students. 1-Submit your One of a Kind story in 350 characters or less. 2-Rally your friends to vote. 3-Once you reach 50 votes, submit a video to inspire more fans. 1- $1,000 in tuition – awarded to each of the Top 5 students on the Monthly Leaderboard. 2- $5,000 in tuition – awarded to each of the Top 5 students on the Leaderboard when voting ends. 3- $100,000 in tuition – Dr Pepper selects finalists to compete to win the Grand Prize at a college football championship game. “NO PURCHASE NECESSARY. INTERNET, EMAIL & FACEBOOK ACCOUNT REQUIRED. Must be U.S. legal resident. Go to drpeppertuition.com to enter/upload story/rules/details. Subject to full Official Rules. Void where prohibited. Must be 18-24 by 12/5/15 and upload your story by 10/19/15 for $100,000 December contest. Must be 18+ for other prizes. Upload your story by 1/11/16 for $5,000 Tuition contest. Upload your story by end of month August-December 2015 for $1,000 Tuition contest. Ends 1/11/16. 2015 Dr Pepper Tuition Giveaway Promotion & Contest – Good Luck! « How to Enter PCH Sweepstakes? Get all the Opportunities! Initials Contest Verification I confirm my initials are DD, and I’m responding by the December 21st (11:59 PM, ET) entry deadline. I’m aware that contest regulations mandate someone with my set of initialsDamaso Davila will win $1OO.OO (Gwy. No. 3818)! Dr. Pepper! I’m entering! Put me on that list of winners. That would be so wonderful to WIN and actually I just started drinking Dr Pepper..